The game was an abject disaster. 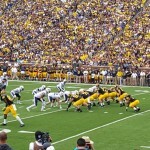 A 31-0 loss to Michigan. There is nothing to sugar coat. BYU got destroyed by a superior Michigan team. They were beaten in every phase of the game. Their offense barely gained 100 yards. The defense again failed to tackle and gave up some huge plays. And perhaps the most glaring deficiency was that Jim Harbaugh completely out-coached Bronco Mendenhall. 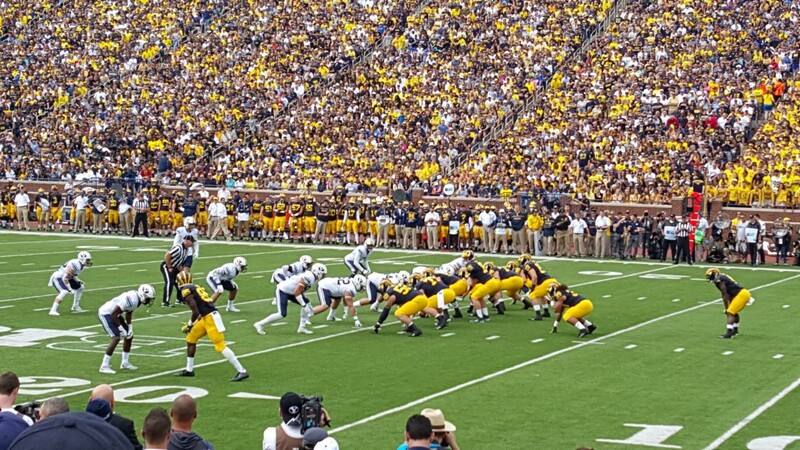 Michigan had a better scheme, they were much more physical, and they were actually ready to play a football game. From the opening drive it looked like BYU was just going through the motions. I think the loss goes down as one of the worst in program history. I rank it only behind the 54-10 loss to Utah in 2011 and the blow-out loss at the hands of Hawaii in 2001 after BYU had started out 12-0. The reason I think it was so gut wrenching is because BYU totally gave away all the momentum they had built in the first three games. This season was shaping up to be something special with two Hail Mary wins and then almost knocking off a top 10 team on the road. Rather than build on that, they went out and got destroyed by a team not nearly as good as UCLA (Michigan really does not have a ton of play-makers. Their QB is kind of just a guy). The loss was a total embarrassment and momentum killer. Furthermore, the score was only 31-0 but it really could have been 50-0. I think Harbaugh called the dogs off a bit in the second half. Frankly, the game would have been easier to stomach if it had been 52-17 or something like that, where BYU at least competed, had some offense, but just got run off the field. That was not the case though. BYU did not compete and they were completely humiliated. They had 12 possessions in the game – 11 punts, seven three and outs. Michigan completely manhandled them from start to finish. And then to make matters worse – Michigan running back De’Veon Smith completely rag dolled a BYU defender on his way to a highlight reel 60 yard touch down run. So, what can we take away from this embarrassment? I say not so fast to that idea. BYU is big into exposure and portraying their University and the University’s message in the best light possible. Getting destroyed on the field and having a huge portion of the Midwest lose any respect for you is not the kind of exposure they want. When is BYU ever gonna go back to Michigan? Yes, I realize they play Michigan State next year but – that’s not the Big House, that’s not against Harbaugh, that won’t be in front of 108,000 people and it may not be on ESPN. I would have been fine if BYU competed and got beat, but again – they did not even show up. You don’t get a second chance to make a first impression. 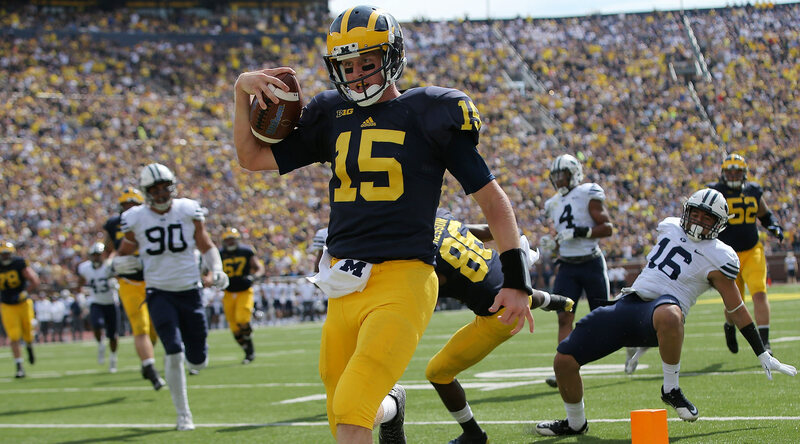 And playing Michigan at the Big House in Harbaugh’s first year is the kind of stage you’ll likely never get again. Or let me say it another way. After the game we bumped through downtown Ann Arbor (which is awesome by the way). They have a really cool main street area that runs for several blocks. Great restaurants, bars, boutiques, ice cream shops, etc. It was a great scene and it’s just due north of the stadium. Tons of people flooded into the area after the game to spend the afternoon celebrating. Everyone was very friendly and welcoming. Anyways, we passed by one particular couple (likely in their 60’s) who was dining out on the sidewalk of a cool little café. The husband had maybe enjoyed a glass of wine or two but he was not hammered. He pleasantly yelled out and asked how we liked Ann Arbor and how the trip was out from Boise. We politely corrected him that we flew out from Salt Lake and told him how great we thought Ann Arbor is, how well his team played, etc. As we moved on down the sidewalk, it donned on me that this guy was representative of many college football fans in that part of the country. I don’t mean to say they are uninformed, but I just think there is a mindset of something like – “We’re not sure if you’re the scrappy little team from Boise that has the blue turf, or if you’re that Utah team that went to a BCS Bowl a few times, or if you’re that Mormon school. And frankly we don’t care. We just know you’re one of those cute little teams from out West and not a college football blue blood like us. That’s why the loss is so devastating – BYU did nothing to change that mindset. Michigan and Midwest college football fans have no more, and probably less respect now for BYU than they did before the game. Again the super fans may say – C’mon, relax. Michigan is not 31 points better than us. Bronco and the team simply had a bad day and laid an egg. We were never gonna run the table and go to a New Year’s 6 Bowl game anyways. Let’s remember who we are think about what a great fireside the players put on all for all the Church members in the greater Detroit area. I disagree with that mindset and think those fans should demand more from their team. Where I do agree with the kool-aid drinkers is that BYU is going to recover and still win several games this year. Tanner Mangum will improve and get back on track against lesser teams. The defense will eventually remember how to tackle, etc. What I’m not sure of though is what BYU is going to do for a running back. The one bright spot at that position, Adam Hine, was injured in the game. Their best defender, Harvey Langi was injured. And finally, are Robert Anae and the rest of the offensive staff gonna find a way to be a little more imaginative? The offense was so predictable and completely impotent. I’m pretty sure BYU will bounce back against some of the inferior opponents but I’m starting to wonder just how. And what happens when they run into another really well coached team. Here’s hoping they can get it turned around quick.